When I was preparing to launch my Great Lakes Romances® series of historical romances back in the late 1980’s, I decided to have historic costumes created that would reflect the era of my stories. The process would allow me to better understand historic fashion, and would provide a gimmick with which I could promote my titles. Both of those goals have been accomplished and repaid me many times over the cost of the costumes. I will share with you the process of dressing Victorian/Edwardian from the skin out, and what it actually means to wear the confining undergarments that are correct for that period. The first concern I had in dressing for the late 1890’s/early 1900’s was that I needed a corset to obtain the hourglass figure that was the standard of the time. My corset was made from an authentic pattern, and my seamstress informed me that I needed to protect the corset, which could not be washed or dry cleaned, from contact with my skin. 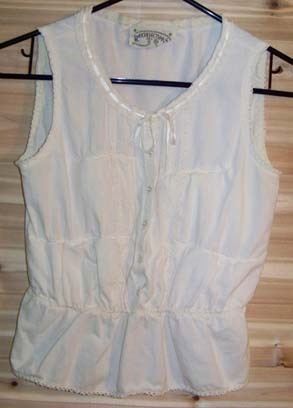 The correct way to do that is to wear a chemise or camisole from an historic pattern. Since I am more concerned with the outward appearance of my costume and less concerned with the parts that would not be seen or affect the final appearance (body shape), I use a modern-day garment, a cotton t-shirt, actually, that does the trick. Over this protective layer of cotton, I put on my corset. The corset is actually two pieces held together by laces in the back and clasps in the front. In Victorian times, one would have a maid to assist with donning the corset and tightening the laces to the proper waist measurement. Since all clothing was tailored to exact waist size with the corset on, there’s no option for wearing it looser if you’re not feeling well or your maid has the day off. In my case, the seamstress created my costume to fit when my corset was laced completely tight, edge meeting edge at the back. And since I often had no one to help me tighten the laces after putting on the corset, I learned to keep it laced tight and then clasp it in front by pulling in my gut and expelling air from my lungs. This can be a major struggle at times because the corset shrinks my natural waist measurement by four inches. Techniques that help, I’ve found, are to first clasp the top and bottom, then work on the ones in the middle. But it seems there is always one clasp in the center that does not want to connect. The corset also has three hooks and eyes below the bottom clasp, and these come together easily once the clasps are hooked. Although the corset creates a wonderfully feminine shape, the effects of long term corset-wearing are quite damaging, and were known and understood as far back as 1890. In order to squeeze the extra four inches of your waistline into a corset, you have to literally reposition your internal organs. When done only occasionally, the results are uncomfortable but not dangerous. For the Victorians, however, the result could be deadly. Here’s a quote from an article that appeared in Victorian Homes Magazine in the summer of 1990. Carol’s family has told her the story of her great-aunt who died at age 36 just after the turn of the century. She had been a concert pianist and wore corsets and elaborate gowns regularly. Not knowing what had caused her death, her husband, a doctor, performed an autopsy. He reported that not one of her organs was in its proper place. Already, fashion had taken its toll. I’d like to tell you some of the drawbacks of wearing a corset aside from those already mentioned. The first time I ever wore my corset, I realized how impossible it is to take a deep (full) breath. You literally cannot expand your lungs enough to do it. No wonder Victorian women fainted! Besides not being able to take a deep breath, the circulation of blood to the brain was being hampered by the tightness of the undergarment. As for eating while in the corset, this is not as uncomfortable as one might assume, but a Victorian woman would certainly never be capable of over-indulging while corseted. I find that I can eat small amounts slowly. I also learned that it is not a good idea to drink anything fast, because liquid is severely hampered en route to your stomach. I discovered another almost humorous aspect of the corset the first time I took mine off. It’s like opening the dam. You quickly realize that you need a toilet, and you need it fast! I learned to do the unhooking in the bathroom. Another aftereffect of removing the corset is the itchiness from heat rash that sometimes develops. And if your chemise or camisole has a seam, you’ll find it deeply impressed into your flesh. 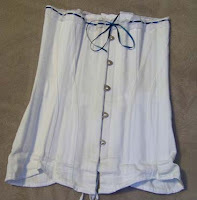 In true Victorian costuming, one would wear a pair of drawers over the corset, or a combination garment that included both a corset cover and drawers. When I dress Victorian, I do not use drawers. I wear my modern day underpants. The waistband of these, I learned from experience, should be pulled over the corset because it’s really hard to pull them out from under the corset once you’ve cinched yourself in. The petticoat goes on over the combination garment or drawers and closes with hooks and eyes. 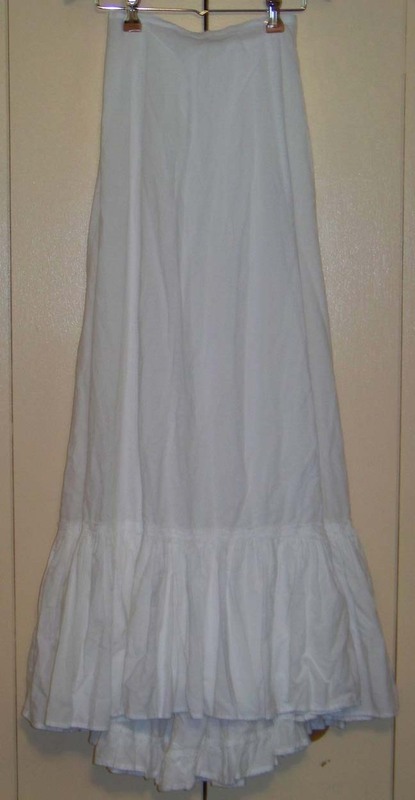 You may notice that my petticoat has no lace trim on the flounces. The pattern called for over 40 yards of lace and ribbon trim, but as I mentioned earlier, I was more concerned with the outward appearance. I elected to leave the trim off because it would have doubled the cost of the petticoat and I would have been the only one to see it. I wear a corset cover made from a Victorian pattern. Inside the corset cover I have added Victorian bust enhancers. Unlike today’s approach to the perfect figure, the Victorian bust enhancers required no surgery, could not leak, contained no dangerous chemicals, were easily removed and 100 percent safe…because they were cotton ruffles! Being thin busted as I am, I have sewn two rows of ruffles into each side of my corset cover. 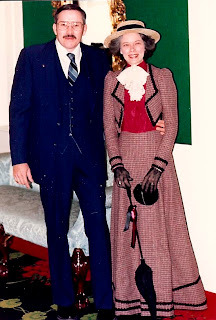 I learned about these from the woman who developed the historic pattern for my Practical Promenade suit. She conducted an historic sewing workshop which I attended soon after I had my costume made. Stockings of the era were cotton lisle stockings held up with lacy garters. I have a pair of these stockings and some simple elastic garters that hold them up, but after wearing them a time or two I switched to stockings made with modern-day nylon because it’s much easier to keep them up. My shoes are modern ones made in a style that has the same shape as the old lace-up shoes of the era. These are not reproduction shoes. Those are quite costly by comparison. Regarding the order of dress, my seamstress warned me to put on my stockings and shoes before putting on my corset because it is hard to bend over to tie shoes while in the corset. I learned firsthand that she is right, but if I forget, I can manage to get the footwear on. It’s not easy or comfortable, though. My outerwear is either a wool Practical Promenade suit (for fall and winter) or a white blouse and dark skirt (for spring and summer). The wool suit has a small check pattern that includes burgundy, beige, and black as the main colors and is a very close match to the original suit from which the pattern was created. The jacket includes an attached burgundy front which makes it appear that it is a blouse and jacket, but instead it is all one piece. The front closes with sixteen hooks and eyes and the jacket has its own set of steel stays to shape the waist. Another feature of the jacket that I particularly like is a stayband. This is a narrow cotton belt sewn inside the waist of the jacket. It fastens in front with hook and eye. At the back, the stayband has two hooks that connect with two eyes sewn to the outside of the waistband of the skirt and prevents the two pieces from ever separating. The stayband is a truly great way to stay “perfectly put together” as someone once told me. 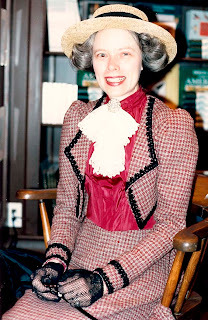 My white blouse is a Battenberg lace blouse created from an authentic pattern, and the skirt I wear with it was created from the skirt pattern of the Practical Promenade suit. 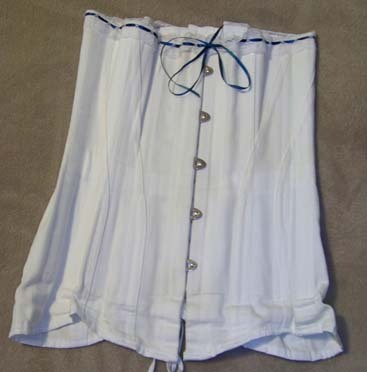 This white blouse-dark skirt outfit was considered the “uniform” of the late 1890’s-early 1900’s. I have another blouse made of ecru cotton and lace that I sometimes wear. The ecru blouse appears to be sewn from an authentic historic pattern and is extremely feminine and beautifully made. I wish I knew more about it, such as the exact era of the pattern and the person who made it, but I have no information on it since I found it at a thrift shop. It was truly the buy of my life because I bought it on a day when the shop was selling a bagful of clothes for $3, and I had seven other items in my bag along with that blouse! Accessories were very important during the Victorian and Edwardian eras. I have several “boater” style hats, some of straw and one of wool. One of my straw hats is laden with artificial (silk look-alike) flowers and a wide striped ribbon. That hat works well during warmer weather. My cold weather straw boater is banded with burgundy and black ribbon to match my suit. I also have lace gloves in three colors: black, white, and ecru. And I have parasols: black to go with the suit and white lace to go with the spring/summer outfit. Also among my accessories are a lace jabot, and an enamel pin that I use to attach it to the neckline of my suit. These were furnished to me by ladies who really knew historic fashion in detail. The enamel pin was hand-painted by a dear friend, now deceased, to coordinate with the colors in my suit. I am especially grateful to have these two items, because they are the perfect finishing touch. I hope you’ve learned some of the firsthand details that no one else has told you about wearing a corset and that you’ve had a laugh or two. Feel free to contact me with any unanswered questions and I’ll do my best to provide an answer. I invite you to visit my website, where I list the books available in my series. I always have a free book drawing in progress there. Also visit my blog where I tackle Great Lakes subjects. Here’s the contact information. Thanks for posting my article! I hope writers will learn and laugh! Oh my goodness! I just can't imagine the torture that must have been to women everywhere! How silly we are to make beauty such a high priority...even to the point of death. Oh, thanks so much for posting this, Donna. I recently won a book from Donna and can't wait to read it! I love your outfit but I don't think I could ever put on a corset. Donna, I'm really hoping you do stop over in Rochester and do a book signing...I would love to meet you. I find that era's clothing absolutely fascinating, and thanks for including the pictures! They make a world of difference, I didn't even know what some of that stuff looked like. Thanks Donna for being here! Sherrinda, Julia, and Casey, thanks for your comments. I'm glad you like my look in the costume. The photos above were taken in 1989 so I look much grayer now, but I still fit into the costume. I had the corset and summer costume on last month for a speaking engagement. I agree that women go to ridiculous extremes for fashion. Sadly, they do it more for other women than for men. (That was discovered in a study about the opinions most important to women when they dress.) Julia, I would love to meet you, too. And I don't blame you for thinking you couldn't put on a corset. I hope women never go to such extremes again, but some of the shoes women wear look like torture to me. Oh, well. A fashionista I am not, except for my historical dress. Casey, it was my pleasure to be here today and share some of the most intimate secrets of my corseted life! Bless you all!